MPPEB Recruitment Exam 2018: –MPPEB invites applications from the Diploma in civil engineering qualified candidates for the available Draughtsman recruitment against 100 posts. Eligible candidates submit application form online on or before 10-08-2018. 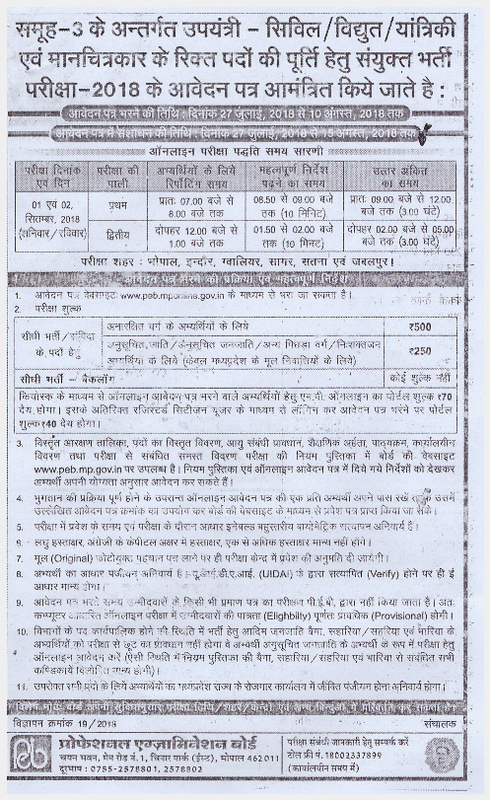 Exam Fee, Salary, Online application process, selection procedure, Exam Syllabus and Pattern, other details are given below for this MPPEB Draughtsman Posts. MPPEB Notification Recruitment Exam 2018. Complete Notification is available for download at www.mp.peb.gov.in. And it is a good practice to read the notification before online application submission. 1. Diploma or Degree qualified students are eligible to apply. 2. Last Date for Submission of Application:- 10-08-2018.